Definition at line 32 of file CEvaluationNodeOperator.h. Definition at line 38 of file CEvaluationNodeOperator.h. Definition at line 21 of file CEvaluationNodeOperator.cpp. Definition at line 27 of file CEvaluationNodeOperator.cpp. References DIVIDE, MINUS, MODULUS, CEvaluationNode::mPrecedence, CEvaluationNode::mType, MULTIPLY, PLUS, POWER, PRECEDENCE_OPERATOR_DIVIDE, PRECEDENCE_OPERATOR_MINUS, PRECEDENCE_OPERATOR_MODULUS, PRECEDENCE_OPERATOR_MULTIPLY, PRECEDENCE_OPERATOR_PLUS, and PRECEDENCE_OPERATOR_POWER. Definition at line 64 of file CEvaluationNodeOperator.cpp. 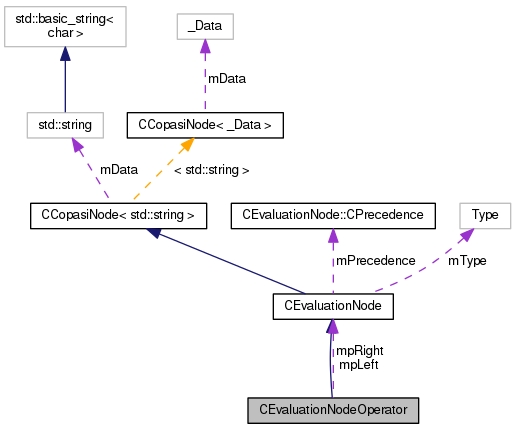 Definition at line 70 of file CEvaluationNodeOperator.cpp. Definition at line 80 of file CEvaluationNodeOperator.h. References C_FLOAT64, C_INT32, DIVIDE, CEvaluationNode::getValue(), MINUS, MODULUS, mpLeft, mpRight, CEvaluationNode::mType, MULTIPLY, CEvaluationNode::mValue, PLUS, and POWER. Definition at line 72 of file CEvaluationNodeOperator.cpp. Referenced by CDerive::deriveBranch(), getBerkeleyMadonnaString(), getCCodeString(), getDisplayString(), getInfix(), and getXPPString(). const CEvaluationNodeOperator* pNode the modulo operator node to be converted. bool which is true on sucessfull conversion. Definition at line 1302 of file CEvaluationNodeOperator.cpp. References CCopasiNode< _Data >::getChild(), CCopasiNode< _Data >::getSibling(), CEvaluationNode::getType(), MODULUS, CEvaluationNode::subType(), and CEvaluationNode::toAST(). Definition at line 257 of file CEvaluationNodeOperator.cpp. References CCopasiNode< _Data >::addChild(), CEvaluationNodeOperator(), DIVIDE, CEvaluationNodeNumber::DOUBLE, CCopasiMessage::EXCEPTION, fatalError, INVALID, MCMathML, MINUS, CEvaluationNodeFunction::MINUS, MULTIPLY, PLUS, POWER, CEvaluationNode::subType(), and CEvaluationNode::type(). Definition at line 184 of file CEvaluationNodeOperator.cpp. Definition at line 136 of file CEvaluationNodeOperator.cpp. References compile(), CEvaluationNode::getType(), CCopasiNode< std::string >::mData, MODULUS, mpLeft, mpRight, POWER, and CEvaluationNode::subType(). Definition at line 111 of file CEvaluationNodeOperator.cpp. Definition at line 86 of file CEvaluationNodeOperator.cpp. Definition at line 1387 of file CEvaluationNodeOperator.cpp. Referenced by CDerive::deriveBranch(), and CFindDimensions::findDimension(). Definition at line 1389 of file CEvaluationNodeOperator.cpp. Definition at line 1399 of file CEvaluationNodeOperator.cpp. References CEvaluationNode::CALL, DIVIDE, CEvaluationNode::getType(), MINUS, MODULUS, mpLeft, mpRight, CEvaluationNode::mType, MULTIPLY, CEvaluationNode::OPERATOR, PLUS, and POWER. 1432 if (flag) out << "</mfenced>" << std::endl; // ??? 1440 //do we need "()" ? 1486 //do we need "()" ? 1511 //do we need "()" ? Definition at line 1391 of file CEvaluationNodeOperator.cpp. Definition at line 1393 of file CEvaluationNodeOperator.cpp. Definition at line 216 of file CEvaluationNodeOperator.cpp. 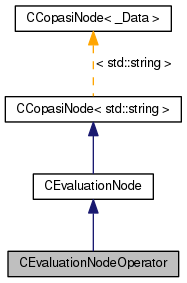 References compile(), CEvaluationNode::getType(), CCopasiNode< std::string >::mData, MODULUS, mpLeft, mpRight, and CEvaluationNode::subType(). Definition at line 462 of file CEvaluationNodeOperator.cpp. References CCopasiNode< _Data >::addChild(), CEvaluationNode::buildInfix(), CEvaluationNode::copyBranch(), CEvaluationNode::copyNode(), CEvaluationNode::create(), DIVIDE, CEvaluationNodeNumber::DOUBLE, CEvaluationNode::FUNCTION, CCopasiNode< _Data >::getChild(), CCopasiNode< _Data >::getData(), CCopasiNode< std::string >::getSibling(), CEvaluationNode::getType(), CEvaluationNode::getValue(), MINUS, CEvaluationNodeFunction::MINUS, CEvaluationNode::mType, MULTIPLY, CEvaluationNode::NUMBER, CEvaluationNode::OPERATOR, PLUS, POWER, CEvaluationNode::simplifyNode(), CEvaluationNode::subType(), and CEvaluationNode::type(). 531 // easier to recognize a negative exponent. 709 // easier to recognize a negative exponent. 727 // because of commutativity the same as before for child1. 835 // easier to recognize a negative exponent. 907 // exponent of 1 or 0 could have been created. 939 // exponent of 1 or 0 could have been created. 971 // exponent of 1 or 0 could have been created. 1112 // exponent of 1 or 0 could have been created. 1144 // exponent of 1 or 0 could have been created. 1176 // exponent of 1 or 0 could have been created. Definition at line 404 of file CEvaluationNodeOperator.cpp. References CCopasiNode< _Data >::addChild(), createModuloTree(), DIVIDE, CCopasiNode< std::string >::getChild(), CCopasiNode< _Data >::getSibling(), CEvaluationNode::getType(), INVALID, MINUS, MODULUS, MULTIPLY, PLUS, POWER, CEvaluationNode::subType(), and CEvaluationNode::toAST(). Definition at line 205 of file CEvaluationNodeOperator.h. Referenced by calculate(), compile(), getBerkeleyMadonnaString(), getCCodeString(), getDisplayString(), getInfix(), getLeft(), getMMLString(), and getXPPString(). Definition at line 207 of file CEvaluationNodeOperator.h. Referenced by calculate(), compile(), getBerkeleyMadonnaString(), getCCodeString(), getDisplayString(), getInfix(), getMMLString(), getRight(), and getXPPString().